The Natural Touch 1500 mattress is made in the UK by Deluxe Beds. A quality renowed manufacturer and member of The National Bed Federation. 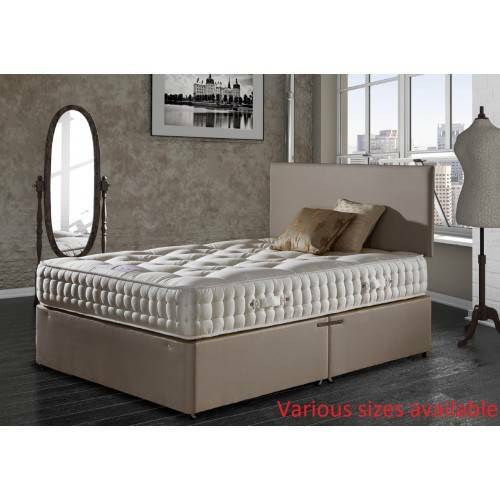 Providing a medium supportive quality mattress with natural fillings. From a range of pocket-sprung options including 1000, 1500 and 2000 pockets complemented with natural fillings for your ultimate comfort. Exclusive hand side-stitched borders ensure traditional edge-to-edge support for this luxury damask upholstered mattress. Made by Deluxe Beds another quality British manufacturer. Fire resistant to Domestic Fire Regulations. If your looking for a good quality medium supportive mattress you won't go far wrong with this.